Open: Monday – Saturday: 11:00 – 19:00, Vernissage: Saturday 16 June at 17 hrs. 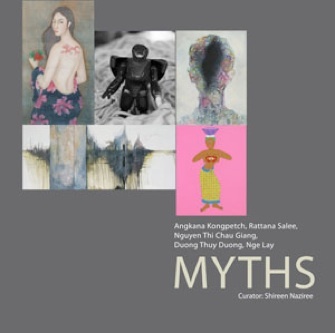 Thavibu Gallery is pleased to present the art exhibition MYTHS featuring works by selected new generation women artists from Thailand, Vietnam and Myanmar. The characterization of the Southeast Asian woman has been embedded in its cultural history and has typically been determined by their physical beauty. This association has commonly been identified through icons such as the Apsaras or mythical nymphs that appear in fables or the romanticism of Vietnamese women clad in flowing Ao Dais. Though Southeast Asian history celebrates “feminine reason and beauty” the notion of gender was built around a public sphere of feudalism despite the fact that learned and powerful women did exist. The exhibition MYTHS examines the status of women in contemporary Southeast Asian society through the works of five women artists from Thailand, Vietnam and Myanmar. Though they once shared a common history, their common cultural values continue to unite their societies - their political histories had carved out different paths that are today visible through various levels of socio-economic progress. Thailand is regarded as one of Southeast Asia’s most developed and economically stable countries where women are regarded on equal status as men. Vietnam through its socialist- capitalism practices introduced through Doi Moi in 1987 has emerged as a rapid growing economy. The contributions by women since the revolution in 1945 and throughout the wars have been significant. And Myanmar, once the most prosperous Southeast economy- now one of the poorest in the world, where women continue to be shrouded despite their contributions to both the economic and political environment. Nguyen Thi Chau Giang (b. 1975) and Duong Thuy Duong (b. 1979) relate how modernisation is influencing the status of women in Vietnam through their paintings. Duong lives and works in Berlin and Giang in Ho Chi Minh City.. Rattana Salee (b. 1982) and Angkana Kongpetch (b. 1982) are both Thai artists whose artistic vocabularies articulate their opinions on the myths that surround femininity from a very contemporary perspective. They have both done sculptural works in the past and pursued studies at the Ecole Superiuere des Beaux Arts, Paris. Myanmar’s Nge Lay (b. 1979) draws inspiration fromordinary working women who quietly form the backbone of her society. Her work has been recognised by important art institutions and included in the permanent art collection of the SingaporeArt Museum.